I am a huge breakfast person–when I don’t have to cook it too often. 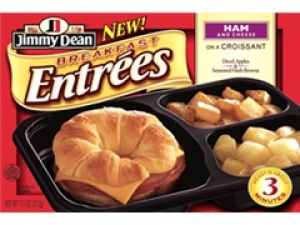 Jimmy Dean has a breakfast line that I just becoming accustomed to, and I’ve had the opportunity to try their ham and cheese entrée breakfast. in the freezer and take out and heat up anytime I wanted. I was a little apprehensive about the heating process because croissants are delicate and can easily harden if left too long in the microwave; however, I did follow the directions and placed it in the microwave for the allotted time. ones, not the shredded kind. I finally made my way to the sandwich–OMG, it was to die for. It wasn’t like my Burger King croissant, but it was close enough. cooking them in the oven and I was glad that I only had to pop the entrée in the microwave for a couple of minutes. I also liked how convenient it is: I can heat it up anytime I want and it’s very filling. At almost three dollars, it could be pricey for some, but I enjoyed eating it and knowing that I can have a ham and cheese croissant anytime I want without having to always reach for my keys. The Jimmy dean ham and cheese croissants are delicious, they are soft and flaky and you wouldn’t know they came from the microwave. It is worth the price to be able to grab one anytime you like and not have to fight through traffic or sit in a long line. Today I wanted to share the best ham and cheese croissants I ve been eating these my whole life. It stared at my grandpa and grandma s house. This was one of my grandma s favourite things to make us and we loved it. Once time she spent hours making homemade chicken noodle soup and we wouldn t eat it. When I say homemade, I mean that she even made the noodles. Now, as an adult, I would love it if someone made it for me, but as a kid no way I wanted my chicken noodle soup from the classic red can. Anyway, the ham and cheese croissants were a much better option for us kids. They were flaky, warm and covered with melted cheese.